Wow, I can’t believe I’m saying this, but what is television coming to? First teen-bride Courtney Stodden is given a reality show, and now we’re finding out that disgraced Christian pastor Ted Haggard and crazy-to-the-hilt Gary Busey are going to appear on a celebrity version of Wife Swap. 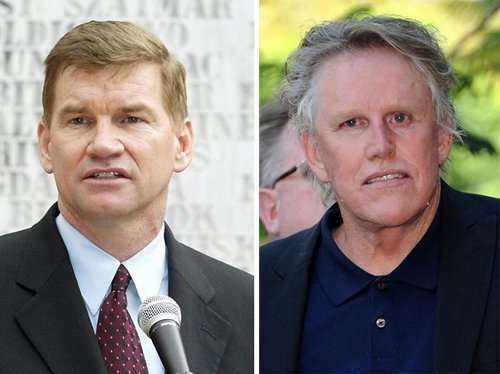 ABC has confirmed that Haggard and Busey will trade marital partners on the first season of “Celebrity Wife Swap”; however, no premiere date has been set. Ted Haggard, you’ll recall, fell from Christian evangelical grace in 2006 after it was alleged that he not only had a homosexual relationship with masseur Mike Jones, but also purchased meth from the guy. At the time, Haggard was staunchly anti-gay, and served as president for the National Association of Evangelicals. Standing by his side before, during, and in the years since the scandal, has been Ted Haggard’s wife of 33 years, Gayle Alcorn. And soon, apparently, she’ll welcome Gary Busey into her home. Something tells me she’ll need a whole new round of therapy after this. Gary Busey, for his part, is offering up his girlfriend, Steffanie Sampson, for the swap. Doesn’t quite seem fair, but who knows – Gary and his girlfriend have an infant son; that’s bound to bring a certain amount of excitement. Especially considering half his DNA comes from a man who is the living definition of marching to one’s own drummer. 50 queries in 0.646 seconds.